Mountain regions are home to one-tenth of the world’s population. Yet they are also among the poorest, most-remote and most-excluded areas. Can ICTs address these issues? Maybe. But, to date, there has been very little research on this: partly because mountain areas are the last places on earth to get connected; partly due to the lack of conceptual frameworks attuned to the specific conditions of these areas. Manchester’s Centre for Development Informatics has published a working paper – Remoteness, Exclusion and Telecentres in Mountain Regions: http://bit.ly/Hvkk4 – which develops two simple frameworks. One looks at the positive and negative impacts that ICTs have on resources moving into and out of mountain communities. 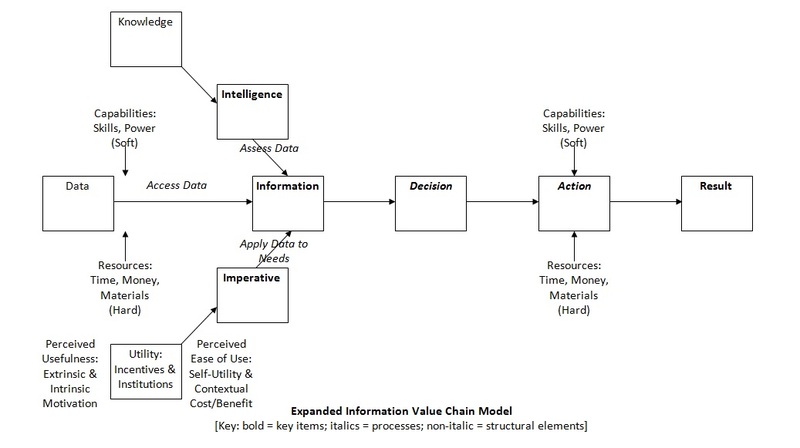 The other looks at the “information chain” (see below): the set of actions and complementary inputs required for information to have a resultant development impact. Using these frameworks to analyse the impact of a telecentre set up within a poor community in the high Andes, we found ICTs enabling new and positive resource flows for the two key user groups: teenaged school students and young farmers. These flows help to maintain social networks. They also support information searches that have improved agricultural practice so long as other information chain resources have been available. 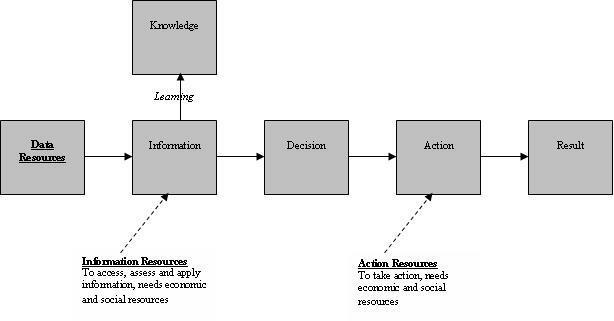 But non-use and ineffective use of the telecentre are found where information chain resources are lacking. ICTs have some impact on intangible elements of remoteness. In this particular example, they also offer access to some previously-excluded resources. But they have not really addressed the systemic exclusions faced by mountain communities. And they so far appear to be a technology of inequality; favouring those residents who begin with better resource endowments. “Info-centric“: focusing less on the technology and more on the data that technology carries. “Chain-centric“: attending to the additional information chain resources – over and above technology and data – that are required in order to turn digital data into development results. “Socio-centric“: recognising that new information chain resources are mainly provided by individuals’ social contact networks. “Econo-centric“: being especially mindful of ICT uses that enable new or more productive income-generating activities. But this work is just a small start: we need much more research to be done as ICTs diffuse into mountain communities; work that takes account of the specific geographies of those communities.